Improve your students’ understanding of and fluency with science vocabulary. 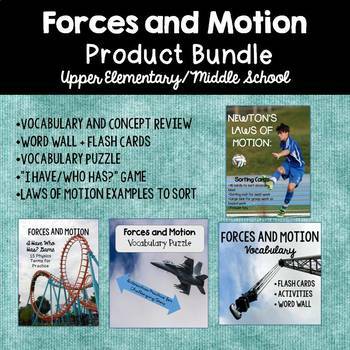 Forces and motion concepts can be very challenging – here is a bundle of 4 products, ready to print and go, that will help your students interact with terms including Newton’s Laws, inertia, mass, speed, force, momentum, acceleration, velocity, simple machines, kinetic and potential energy, and push/pull. Use these for centers, review sessions, seatwork, group work, morning work, bell work, homework, stations, and more. Flashcards and large sorting cards are also great for word walls and bulletin boards. $10.50 value if purchased separately!